No cover charge! Live jazz 8-11pm. 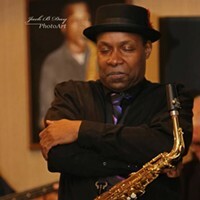 Call for reservations - (412) 232-3001 Tony Campbell is the youngest saxophone player inducted to the Pittsburgh Jazz Society's Hall of Fame in 2010. His musical journey began in the hill district in 1973. At the age of 13 Tony joined a band called The Deltones. 1979 Tony attended Berklee College of Music, came back to Pittsburgh in 1982 and enrolled in The University of Pittsburgh under Dr. Nathan Davis. At the age of 22 he recorded and toured with Roy Ayers. Later that year he joined Roger Humphries and RH Factor.